WELCOME VENEZIA & 12OZ MAX! 15 Sep WELCOME VENEZIA & 12OZ MAX! Benders are proud to introduce the new vending Venezia design & 12oz Max cup. Benders’ new 12oz Max vending cup increases each vending machine turret’s capacity by up to 35%. The additional capacity provides a number of benefits to the vending operator, for example; reduced machine refill visits, greater usage opportunities for twin turret machines and increased opportunities to site machines in high volume sites. The new 12oz max cup retains the rim diameter of the existing 12oz vending cup, so there is no need for operators to adjust or replace cup dropping units. 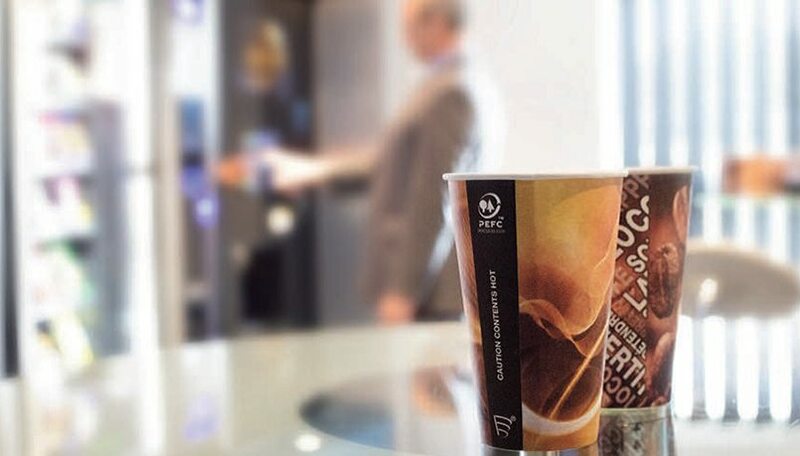 This new cup design replaces the existing 12oz vending cup, combining the proven reliability of its predecessor with improves space efficiency for increased machine turret capacity. Supporting the new 12oz Max cup, Benders have also introduced the new contemporary Venezia design. Featuring two innovative, coffee-led designs creating added interest and appeal at the point of dispense, reflecting the artisan coffee culture of the high street and reinforcing the experience of high quality vending drinks. The Venezia design is available in 6oz, 7oz squat, 7oz tall, 9oz tall and the new 12oz Max. The high levels of detail and contrast in the stylish ‘Steam’ design contrast superbly with the clarity and definition in the ‘Beans’ design. The new Venezia stock design showcases the amazing new print quality Benders can deliver. Venezia also brings a little heritage to the company, this cup design has been named after Venice, where the very first coffee shop in Europe was founded/ Benders began life as a small family business in the UL in 1899. But it is now owned by Flo & DoPla, who are both Italian based plastic disposable manufacturers. The Italians are renowned worldwide for their coffee, and the names of the Venezia and Verona ranges are a nod to that excellent reputation and Benders’ Italian owners.